Protesters and supporters carry banners and placards as they march with the hearse of slain Kian Loyd Delos Santos, a 17-year-old student, during his funeral, Aug. 26, 2017, in suburban Caloocan city north of Manila, Philippines. The killing of Kian has sparked an outcry against President Rodrigo Duterte's anti-drug crackdown. Philippine President Rodrigo Duterte could be rethinking the scope of his deadly anti-drug campaign after the slayings of three teenagers angered an otherwise supportive public. But analysts say extrajudicial killings are likely to persist. In mid-August, 17-year-old high school student Kian Loyd Delos Santos was shot to death in a city north of the capital, possibly at the hands of police. The death sparked street demonstrations in Manila and a 40 day bell-ringing protest by the Catholic Church. Last week a 19-year-old man was found shot to death and the body of a 14-year-old boy turned up full of stab wounds. Investigators are looking at the police in both cases. The cases threaten to erode support for Duterte’s otherwise popular anti-drug campaign, which has come under fire from overseas for its use of extrajudicial killings. The tough-spoken 72-year-old president approved the campaign after he took office in June 2016, pledging to wipe out drugs within six months. Some Filipinos worry more because the ruling party-heavy legislature this week allocated a symbolically low 1,000 pesos ($19.50) in 2018 for the country’s Commission on Human Rights, an agency that could question police practices. The funding decision shows Duterte’s government is “perpetuating a culture of impunity among the ranks of policemen,” an arm of the opposition Liberal Party said in a statement on its Facebook page. But Duterte pledged via the presidential office website a “thorough and impartial investigation” into the death of Delos Santos. Police officers stand behind a police line after a man was killed during a police anti-drug operation in Caloocan city, Metro Manila, Philippines, Aug. 17, 2017. Experts say Duterte’s slap at the police may be a sign that he will refine his violent approach to drugs without calling it off. 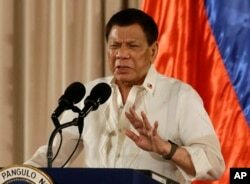 Duterte had temporarily lightened up in February, with a new focus on stopping excesses by the Philippine National Police after the death of a Korean businessman in custody. His drug enforcement director general, Aaron Aquino, was quoted saying in Philippine media Wednesday he prefers to rehabilitate 1.3 million drug addicts who have “surrendered” to authorities. Adding pressure from the public, some Filipinos suspect that upstream drug manufacturers and dealers have escaped the crackdown, Araral said. Duterte’s government had earned the satisfaction of 75 percent of Filipinos in the first quarter of 2017, Metro Manila-based research institution Social Weather Stations found. It said 66 percent of people were satisfied with the anti-drug campaign. Survey agency Pulse Asia found in March that 79 percent of people approve of the government’s effort to control crime. Common Filipinos often say their neighborhoods feel safer under Duterte’s watch than before. The methamphetamine strain “shabu” anchors street crime around much of the archipelago with a population of 102 million. 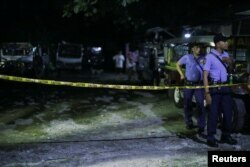 Any shift in the drug campaign, which New York-based advocacy group Human Rights Watch estimates has led to 7,000 extrajudicial killings, would be intermittent or gradual, analysts warn. Any shift in anti-drug work may just mean the police act more carefully around minors, especially in view of CCTV cameras, said Herman Kraft, a political scientist at University of the Philippines Diliman.